Washington senior Maddy Jenkins (24) puts up a shot between two Chillicothe defenders during a Frontier Athletic Conference game Wednesday, Dec. 5, 2018. Jenkins scored 10 points and had seven rebounds help Washington to the win. 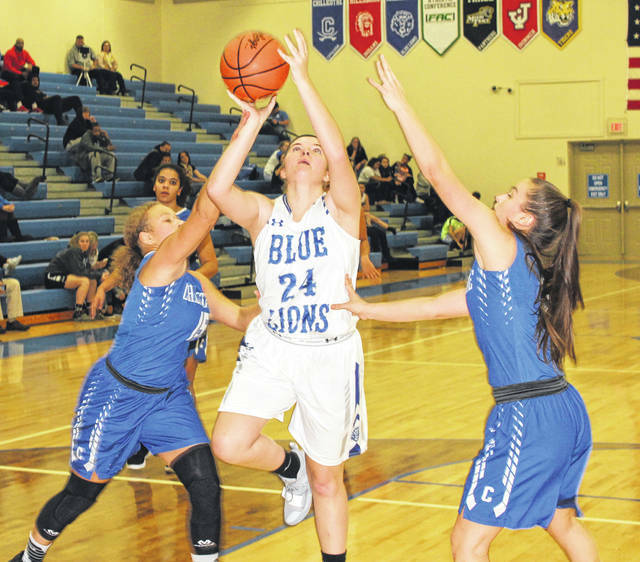 The Washington Lady Blue Lions began the game against Chillicothe Wednesday with a strong opening quarter and followed that up with a solid second quarter en route to a 45-21 Frontier Athletic Conference victory over the Lady Cavaliers. Washington (now 2-2 overall, 2-0 in the FAC) was led by senior Hannah Haithcock with a game-high 16 points. It was another double-double for Haithcock as she grabbed a game-high 11 rebounds. Junior Halli Wall hit three three-point field goals on her way to scoring 11 points for Washington. Senior Maddy Jenkins scored 10 points and had seven rebounds and junior Rayana Burns had eight points and six rebounds. Junior Julia Hall hit two threes and had eight total points to lead Chillicothe and senior Hayden Price had two threes and a total of seven points for the Lady Cavs (now 0-6 overall). Washington scored the first basket of the game in the very early going. Chillicothe tied the score with 3:44 to play in the quarter. Washington then went on a 13-1 run to take a 15-3 lead. The Lady Lions outscored Chillicothe 9-3 to begin the second quarter. Washington had 18 points in the second, their top offensive quarter of the night, while Chillicothe had its best offensive output (8 points) to put the halftime score at 33-11. Both teams struggled offensively in the third quarter. The Lady Lions scored two points to five for the Lady Cavs. Washington held a 35-16 lead with eight minutes remaining. The Lady Lions doubled up on Chillicothe in the fourth quarter, scoring 10 points to five to set the final score at 45-21. “I felt like we got off to a great start tonight,” Washington head coach Samantha Leach said. “We keep talking about how important the first four minutes are. The girls did a great job, not only in the first four minutes, but in the first half. “We really executed in the first half,” Leach said. “In the second half, we struggled to put the ball in the hole. Elsewhere in the FAC Wednesday, McClain beat Miami Trace, 37-35 and Jackson got by Hillsboro, 36-31. Washington is home against Jackson for an FAC match-up Saturday at 5:30 p.m.
Chillicothe (0-2 in the FAC) has another conference game Wednesday, Dec. 12 at McClain with the j-v game starting at 5:30 p.m.
WASHINGTON — Rayana Burns 4-0-8; Bre Taylor 0-0-0; Tabby Woods 0-0-0; Halli Wall 1 (3)-0-11; Shawna Conger 0-0-0; Maddy Jenkins 5-0-10; Hannah Haithcock 8-0-16; Abby Tackage 0-0-0. TOTALS — 18 (3)-0-45. Free throw shooting: o of 0. Three-point field goals: Wall, 3. Field goal shooting: 21 of 51 for 41 percent. Turnovers: 10. CHILLICOTHE — Zoe Ford 1-0-2; Makenzie Greene 0-0-0; Julia Hall 1 (2)-0-8; Emma Barnes 0-0-0; Aries Barnes 1-0-2; Alysia Cunningham 1-0-2; Hayden Price 0 (2)-1-7; Meliah Johnson 0-0-0; Taylor Simmons 0-0-0; Olivia Johnson 0-0-0; Emma Ward 0-0-0. TOTALS — 4 (4)-1-21. Free throw shooting: 1 of 4 for 25 percent. Three-point field goals: Hall, 2; Price, 2. Field goal shooting: 8 of 43 for 19 percent. Turnovers: 10.